Is WordPress Reykjavik Theme Clean, Light And Accessible? 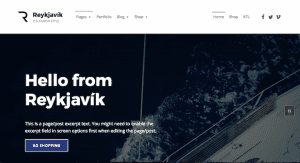 Reykjavik theme is a relatively new addition (October 2017) to WordPress’ family of accessibility-ready themes. It was created by Oliver Juhas of WebMan Design. Oliver has created a number of accessibility-ready themes, some free and some paid. The name Reykjavik evokes a product which is clean and modern. The theme description begins: Reykjavik is fresh, lightweight,… Continue Reading Is WordPress Reykjavik Theme Clean, Light And Accessible? PixelEmu School Theme Review – Is It An A+ For Accessibility? Joomla Monster is known for creating accessible Joomla templates. They kept getting requests for WordPress themes, so decided to set up a new company to develop them. PixelEmu launched in 2015. You can see their commitment to accessibility in this video: I was kindly given a copy of the PixelEmu School theme to try out, and to… Continue Reading PixelEmu School Theme Review – Is It An A+ For Accessibility?